The newly expanded 5120 series filtered inlet launched by Schurter provides customers with more design choices. In addition to various performance features offered in the compact package, the customer can now select between the new front panel mount version with plastic flange and the existing version with metal flange. The plastic flange is modernized to eliminate the bevel around the inlet, providing an attractive flat design that nearly covers the entire surface of the metal flange of the filter case. Mounting takes place with either counter-sunk or flat-head screws. The inlet is equipped with a notch for V-Lock retaining cordsets. The EMC filter is available in standard, medical M5 or M80 versions. The standard filter version uses capacitors class X2 and Y2. Alternatively on request, are versions with capacitors class X1 and Y1 for enhanced surge withstand voltage protection. 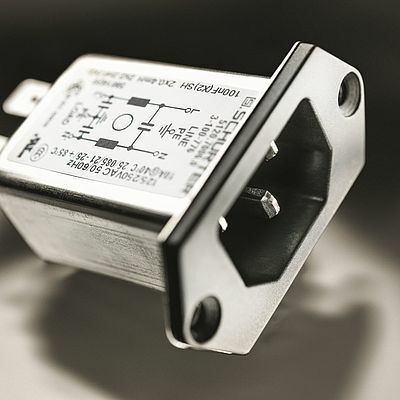 The series is also available in a protection class II version, without ground pin, according to IEC 61140. The integrated filter at the power input provides highly effective interference suppression, which results in optimized electromagnetic compatibility. Current ratings for the 5120 series range from 1 - 10 A (IEC) or 1 - 15 A (UL) at 250 VAC. The standard 5120 offers quick-connect terminals 6.3 x 0.8 mm, solder terminals, wire leads or PCB terminals. The series is ENEC, cURus and CCC approved and suited for use in equipment according to IEC 60950, IEC 60601-1, in addition to IEC 60601-1-11. SCHURTER's range of protection class II inlets and power entry modules offer a broad selection for use in medical homedics equipment. Customized Power Supplies, Power Cords and Battery Holders. Desktop and Medicine, different Country types.